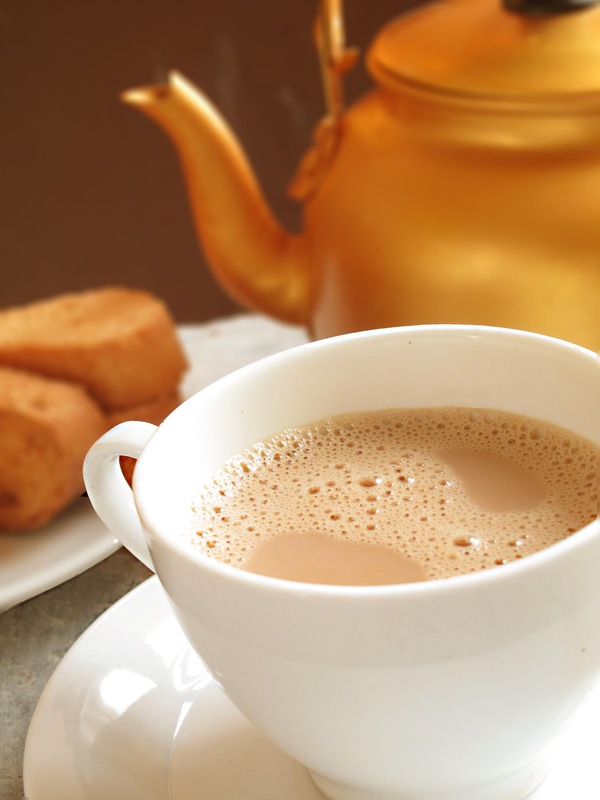 Tea to most Indians is like coffee is to the Western world even though coffee is more famous in Southern India. A simple cardamom studded chai is a daily affair in our lives. 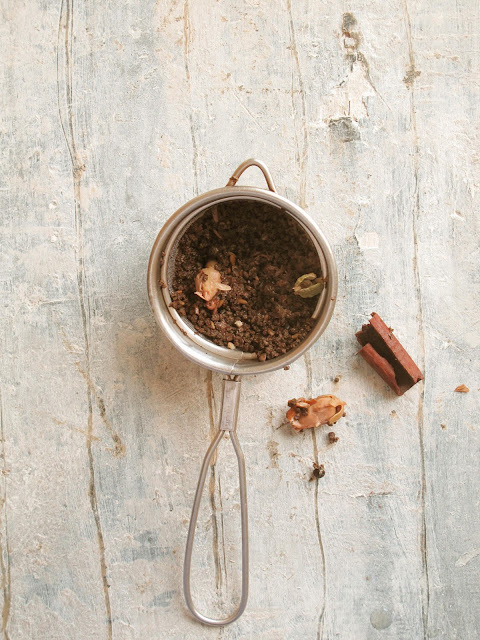 But as the winters walk in, the warmth of spices takes the daily chai to a different level. Ask an Indian, and they will leap at the thought of having freshly made steaming tea on the street stalls on a chilly day. I need tea to start my day. More precisely, I need a strong, slightly sweet and milky tea to get me out of the bed. I bend towards Turkish coffee for evenings but I can vouch for most Indians needing tea for more than two times a day (read M) . I for one can't do with packaged masala tea powders. I think it tastes like crap. I don't even make masala tea powder at home. No I don't think that makes the cut for me either. There are certain disadvantages which I see with making masala tea powder at home. Firstly although I can never get bored tea in general, but I do like different types of masala tea everyday. Someday very gingery calls my name and some days I want fennels seeds and someday I want alot of warmth from cinnamon and other times I want it all. Using masala powder would mean I stick with the same spice mix each day. Secondly, well okay there isn't anything secondly but you get the point. Depending on my mood, what I have on hand, I keep switching up the spices in the masala chai. Everything keeps changing but one thing, cardamom. Here's an ideal spice mix for two cups of tea. Remember what I said before, play around, use what you like, increase what you want, decrease what you don't like. Its your baby! It might as well be your trade mark. * Some people prefer way more milky tea than that and make equal proportions of water and milk. Some even use more milk than water. More milk leads to milder tea so choice is yours. Bring the water, tea, sugar and spices to a boil. Depending on preference and strength required determine the time for which you boil the tea. I prefer about 5-10 minutes. If you are looking for a milder tea you can add the tea after the first boil. Add milk and boil for another 5 minutes. Strain and serve hot with Indian biscuits or biscotti. Nice Kulsum. Gorgeous photos. I like the shade of the Masala chai too!! btw now following you on stumble upon too!! Very sharp looking post!! Great job!! I'd never thought to make my own chai tea... but it sounds so comforting! Great post! Yes he did. He calls himself spot boy when he WORKS for me. And yes, chai, rusk and gossip, ultimate Indian get together! 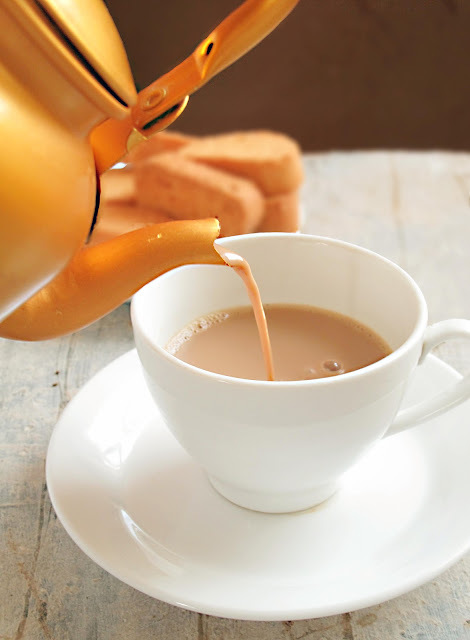 I love masala chai too, but I brew it with rooibos. 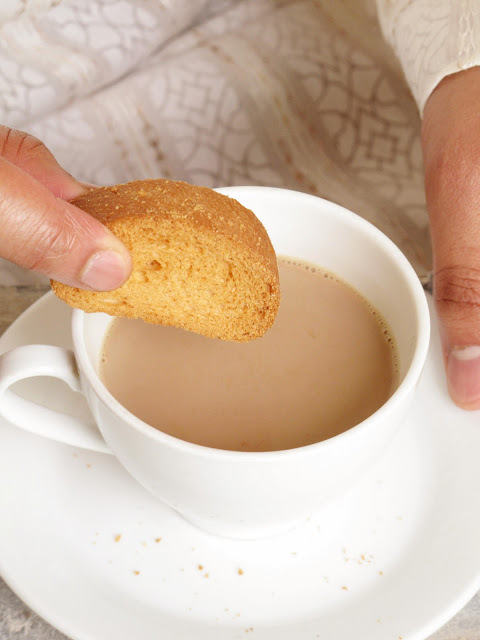 The tea rusks look so appetizing as well. This is the kind A loves and I do not like :-) This is a wonderful post and some crisp pictures.. Somehow I knew u ll put fennel in your chai..I knw you love them..have seen extensively in your posts.Lovely post..a good cuppa masala chai is something I can have any time of the day or night for that matter. I really like the pictures Kulsum! 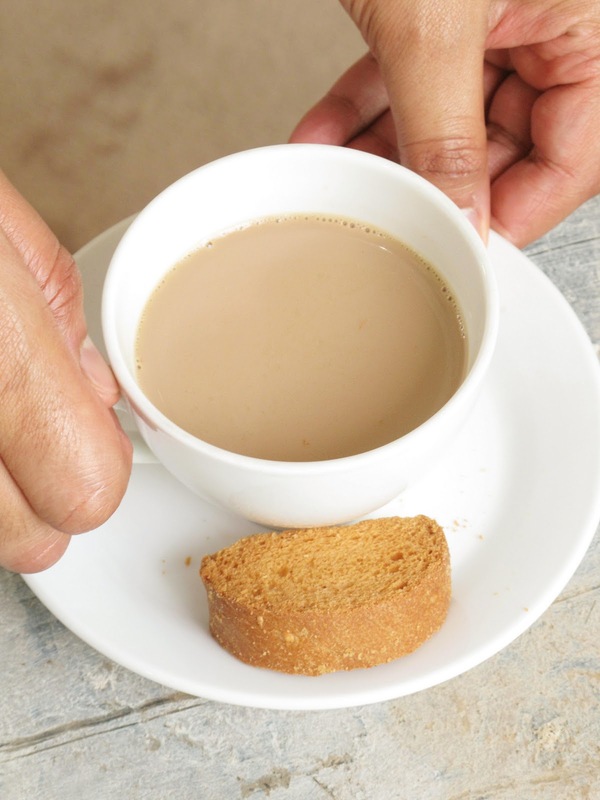 Especially the one where you can see the hand about to dip the biscotti. I need to make a non-caffeinated version of this. I love chai spices. I'm not a chai fan but I do want to tell you this...you're photos in the last few posts have been awesome!!! Love to have hot chai anytime especially in winters and this chai is looking gorgeous. Will try this awesome recipe right tomorrow morning...cheers Kulsum !!! I love home made masala chai in winter too! Beautiful photos. Mmm this reminds me of the chai my Gujarati best friend would make all the time. Just the smell alone would make me feel better instantly. Thanks for sharing your lovely tea! I've only started liking milky teas recently and slowly falling in love. This recipe sounds wonderful! I've been lucky enough to have friends make it properly for me and I agree, the powders and packages can't compare. I haven't yet made it for myself. Thank you for the inspiration and lovely photos. god, this looks lovely! i just picked up some fennel, star anise and allspice from the store yesterday so i'm going to try this out today. Have everything else except the rose petals. Quite ashamed - have never really had proper chai before and my parents are from India! I love Chai so much. Your pictures are really beautiful. I love chai tea. Your photographs are stunning! Came here through IndianSimmer. Gorgeous pics and you have made a simple tea look so very tempting! I used to make something similar for my parents when I was younger - they had a very specific recipe that us kids had to follow to a "T." You are totally right - Indian people don't joke around when it comes to their chai. Will you share your parent's recipe? I love chai but have never made it at home! This looks like it would be super fun to try!! Looks amazing! Beautiful pictures. Unfortuantely I don't have all the spices I need to make it tonight! found your blog through foodpixels on twitter and your photos are simply stunning - not to mention your delicious recipes. Glad I found you! Thanks to Dario :-) Thats kind of you. Thank you. who can compete these posts with expansive photos? My preference is chay with a single flavor - ginger, cardmom. Better still, made with leaf from Darjeeling, Assam,.. The one I tasted in Calcutta once is the best. They say, what is available in most stores is just third rate. It is all powdery, dust, a mixture from all sorts of plantations. Ideally, if one can get tea leaves from a single plantation, then you can brew the best tea with a nice flavor. Tea still beats coffee in some aspects - you can make ginger tea or honey tea to relieve sore throat, cough etc. Very good recipe. Very delicious and I found it very calming. I added a tbsp of tumeric as my indian doctor here in Australia takes a tsp of tumeric with honey every morning and swears by its antibacterial properties. was wondering what indian people feel towards green tea? what is indian people prefernce towards it? After 5 nice trips to India hosted by my Indian friend, have tasted many of these dishes. Brings back happy memories. you have really a nice blog: wanna please add my website about Tea Maker in your blogroll? I am not a complete chai person. Period. In my household we cook the tea in water, pour it in a cup and then add the milk...my mothers' side of the family that is and that is Karachi... However, my dadiyal or fathers' side of the family up in the hills of Pakistan enjoys traditional 'doodh-patti' or milk tea..n i love it, specially on chilly days and was hoping to master it..So I'm going to give this one a try and satisfy my tastebuds! Most of the people not interested to take spices in food for those kind of people I always used to recommend adding those spices it tea. I tried it today......niceeeeeeeee...thanks ! Fatteh Hummus - Its not just a dip its a meal!